Birthplace : Wahoo, Nebraska, U.S. The American scientist, educator and administrator George Wells Beadle demonstrated the role of genes in the control of biochemical reactions in living organisms. George Beadle was born on October 22, 1903, in Wahoo, Nebraska. He obtained an undergraduate degree in biology in 1926 and a master's degree in 1927 from the University of Nebraska, where he developed a specific interest in genetics, especially that of corn. Beadle continued graduate study at Cornell University under the joint guidance of geneticist R. A. Emerson and cytologist L. W. Sharp during a period when studies combining the methods of cytology and genetics were most profitable. After receiving a doctorate in 1931, he joined the California Institute of Technology, first as a fellow of the National Research Council and then, until 1936, as an instructor of biology. He later served Harvard University as an assistant professor of biology (1936-1937) and Stanford University as a professor of biology from 1937 to 1946. The two most puzzling problems in genetic research at that time involved the mechanisms by which recombination occurs between linked genes and the ways in which genes control the development of the hereditary traits for which they are responsible. Beadle's greatest successes came in studies of gene action, especially through the development of methods of experimentation permitting both extensive and selective observations of phenomena previously known only from sporadic spontaneous occurrences. Interactions between tissues of different genetic constitutions had been occasionally observed in spontaneously occurring mosaics. In 1935 Beadle and Boris Ephrussi at the Institut de Biologie Physico-Chimique in Paris succeeded in producing equivalent situations at will and involving any desired combination of genotypes by injecting organ buds from fruit fly (Drosophila) larvae into the body cavities of other larvae, where they continued to develop. In 1946 Beadle was recalled to the California Institute of Technology to direct the division of biology. He gave up his own research efforts at that time. In 1961 he became president of the University of Chicago, a position he maintained until his retirement in 1968. By then he had accumulated more than 30 honorary degrees from many universities around the country and had been awarded memberships into several prestigious academic societies. 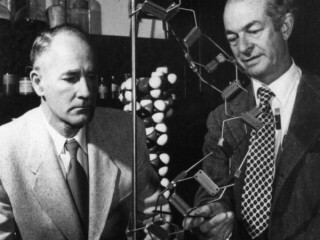 However, chief among his accolades remains the Nobel Prize for Physiology or Medicine, which he shared with Edward Lawrie Tatum and Joshua Lederberg in 1958 for his work on the "one gene-one enzyme" concept. In the 1960s Beadle renewed his interest in the genetics of corn and became a prominent figure in the "corn wars, " a debate among geneticists and archaeologists over the domestication of corn or maize in the Americas. Beadle contended that modern corn comes from a Mexican wild grass rather than a now-extinct species of maize. Beadle drew his conclusion from corn remains that show that domestication occurred at the time of the Mayans and Aztecs. From 1968 to 1970 he directed the American Medical Association's Institute for Biomedical Research and from 1969 to 1972 served on the council of the National Academy of Science. He collaborated with his wife, Muriel Beadle, on the Edison Award-winning The Language of Life: An Introduction to the Science of Genetics. Beadle died June 9, 1989, in Pomona, California, at age 85 from complications of Alzheimer's disease. View the full website biography of George Wells Beadle.